What is Friendship at Home and How Can it Help Me? These are not people who will be content to simply go into a nursing home when their health starts showing its age. They want to remain independent and keep doing as much as they can. The trouble is, not every senior has a support system in place that enables them to remain in their own home when health concerns arise. Well, they do now! Friendship at Home is a unique home health care opportunity that brings just the right kind of help into the home whenever a need presents itself. Membership in our system guarantees you everything from cleaning help, personalized nursing care and check-in services to companionship and more. You are growing older and you know that you are going to need some help from time to time. Maybe you need someone to come in and do deep cleaning around your house or apartment, or perhaps preparing meals has become a challenge. Whether you need a little help or full-service nursing care, Friendship at Home is able to step in and coordinate the things you are no longer able to. Independent living is very important to most seniors. While some don’t mind entering an assisted living facility, many others want to stay in their own home where they feel comfortable. The trick to remaining home safely is to develop a home health care plan that gives you what you need when you need it. 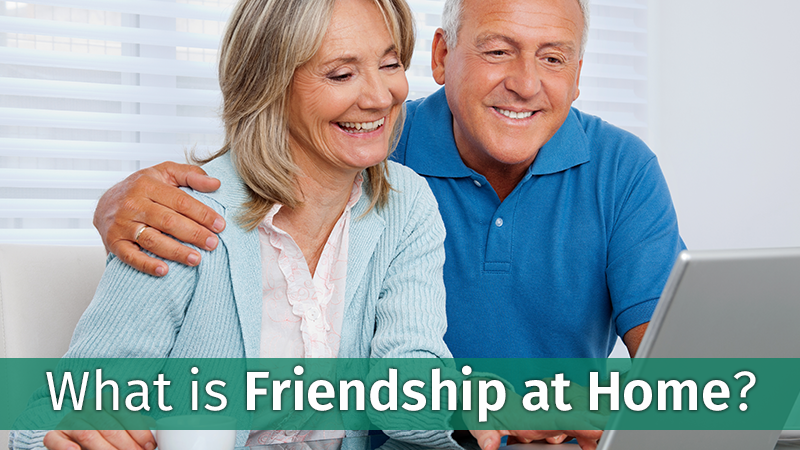 Friendship at Home is a unique home-based continual care program offered in Central Ohio. The concept is simple — clients pay a membership fee to join and monthly fees afterward to ensure that quality health and home living services will be provided if and when they are needed. No one knows when a health concern will hit. Maybe you fall and injure yourself and need help around the house for a few weeks. Or maybe you are stricken with cancer and require more complicated health care attention during your treatment. Friendship at Home is always ready to step in and take care of a client’s needs. From your first day of membership, you will be assigned a home care coordination specialist who will assist you in scheduling whatever services you need. For some clients, no help is needed for months (or even years). That’s okay. When services are required, no matter how simple or serious the situation, they will be made available. That means if you find yourself in the hospital and need assistance upon release, all you need to do is pick up the phone and make a single call. Your home care coordinator will figure out all the details and have the help you need at your home when you arrive. In the event you need to move to an assisted living, rehabilitation or nursing home facility, your membership in Friendship at Home will continue to provide assistance via your care coordinator. Peace of mind is vital to today’s senior who wants some assurance that they can remain independent for as long as possible. Membership in Friendship at Home ensures that you can stay in your own home as long as possible, no matter what health concerns arise in the future. Offering quality health care and home living assistance, our home health care specialists are always ready to offer just the kind of individualized help you need. Come visit us at one of our upcoming seminars to learn more about our program. You can view our events calendar here. Contact us today to find out more about how Friendship at Home can make it possible for you to stay in your own home throughout your senior years.